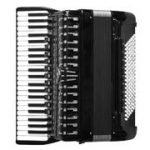 Accordions South West (UK, South West): Accordion Tuition, Accordion Repairs, Accordion Buying Guide, Used accordions, Hohner Accordions, Beltuna Accordions, Weltmeister Accordions, Melodeons. Cottage industry run by a committed amateur accordionist Elena Erber. Each accordion back strap made by them is cut, stitched and assembled with care and precision. Online Accordion Radio with accordion music only. "We broadcast a variety of Accordion Music from jazz to classical to a bit of pop. There is something for everyone to enjoy!" Infinite Accordion explores the many influences of the accordion on modern and traditional music from all over the world. You'll be surprised and delighted. Accordion Utopia (Lancaster, Pensylwania, USA): accordion museum, accordion store (they buy, sell new and used accordions), accordion services (tuning, re-waxing, repair, cleaning, restoration, adjustment, decoration). BestPractice is free software which let you slow down music without changing pitch. You can change tempo of recorded tune and practice accordion playing with slower version.